Lake Oroville State Recreation Area offers a wide variety of outdoor activities including camping, picnicking, horseback riding, hiking, fishing and boating with a good number of accessible areas. The 15,000 acre lake was created as part of the California Water Project when the tallest earth-filled dam in the country was constructed along the Feather River. The Visitor Center is off Highway 162 (Olive Highway) on Kelly Ridge Road. Phone (530) 538-2219 to for more information. The Coyote Campground has seven accessible campsites (#3, #42, #43, #45, #47, #48, #51). Accessible restrooms and shower facilities on an accessible route are nearby. The Horse Camp has accessible campsites and a combination restroom/shower facility. The Campfire Center has accessible seating and paths of travel and offers assistive listening devices. There are three accessible campsites dispersed between the Big Pine Campground and Gold Flat Campground (#30, #65, #75). Accessible restrooms on an accessible route are nearby to all three campsites. Accessible showers are available in the Gold Flat Campground near site #30. There are three generally accessible campsites at the Lime Saddle Campground (#9, #15, #18). Generally accessible restrooms along a generally accessible route are nearby to all three campsites. Accessible parking is available near the restrooms. Accessible parking and an accessible vault restroom are available. Accessibly designed tables are available. Routes to tables are across compacted dirt/gravel. This prime bird-watching territory has six accessible picnic sites on accessible routes. Accessible spaces, including one van accessible, are available. An accessible restroom is available. 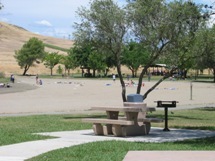 The Swim Beach has accessible picnic tables, water faucets, and parking available. The North Forebay Trail is a beach access trail that allows waterfront hiking along the forebay and is accessible for 0.95 mile. Trailhead, accessible parking, and accessible restrooms are at the North Forebay. The Potters Ravine Trail is accessible for 0.6 mile, round trip. Trailhead, accessible parking, and accessible restrooms are at the Spillway area. The Wyk Island Trail is a lakeside trail that is accessible for 0.2 mile. Trailhead, accessible parking, and accessible restrooms are near the Bidwell Canyon boat launch parking area. The Chaparral Interpretive Trail is located adjacent to the Visitor Center and offers visitors a short 0.25 mile loop trail through a microcosm of environments found around the lake. This trail contains many interpretive panels to learn about the diverse local ecosystem. The trail surface is constructed of compacted soil. Accessible parking and generally accessible restrooms are located at the Visitor Center. The Bidwell Canyon Bike Trail is barrier-free, though not accessible, for 5.5 miles through a foothills environment. It may be usable and challenging for strong wheelchair users. Trailhead, dirt parking lot, and an accessible vault toilet are available at Saddle Dam. 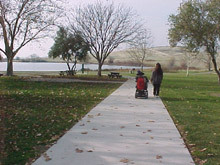 An accessible paved path weaves from the parking area through the picnic area and to the water's edge. Accessible parking and restroom are nearby. An outdoor rinsing shower is accessibly designed. The Visitor Center is generally accessible. 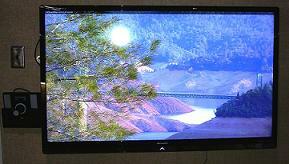 Exhibits are generally accessible and include captioned video. A user-controlled camera, connected to a TV within the Visitor Center, provides visitors with a mobility impairment an alternative to the inaccessible lookout tower. Exterior restrooms are generally accessible. Parking lot includes two accessible spaces in front and two behind the Visitor Center. The route of travel to the building from the front spaces is accessible. The Toll House Visitor Center, open seasonally, is accessible and provides interesting history about the area. Accessible parking and restroom are available. A short path across the nearby bridge is accessible. There is an accessible fish cleaning station with nearby accessible parking and an accessible vault restroom. An accessible fish cleaning station is available, including accessible restrooms and parking in both upper and lower lots. An accessible fish cleaning station, restrooms, and parking is available. An accessible fish cleaning station with nearby accessible parking and restrooms is available. 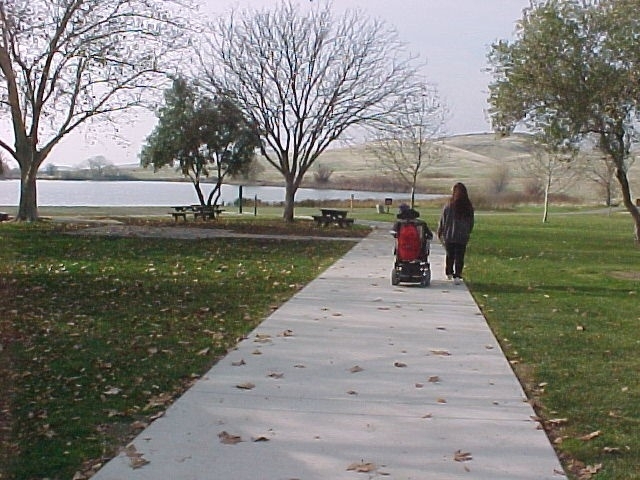 The store and restaurant at the Bidwell Marina are accessible; however when lake levels are low, visitors with mobility disabilities may require assistance navigating the steep walkway that leads to the floating marina facilities. During periods of low lake levels the marina operates a shuttle service to assist visitors in reaching the marina and staff is on hand to help out and offer assistance whenever it is requested. The marina operates an accessible shuttle boat to assist owners of moored vessels in reaching their boats and patio pontoon boats are available to rent that are designed to be accessible to people who use wheelchairs, including accessible toilet facilities on board. Requests for assistance can be made in advance by calling the marina office at (530)-589-9175. Located in the Lime Saddle Area, the Lake Oroville Marina includes accessible parking, restrooms, boat slips and marina store. The marina has six accessibly designed houseboats for rent and offers water and dry land shuttle service to people with disabilities upon request. Call (530) 877-2414 for more information.